Virgin Galactic’s SpaceShipTwo VSS Unity took its first powered flight on April 5, 2018. This was the program’s first flight test in more than three years after a tragic accident on October 31, 2014, when SpaceShipTwo VSS Enterprise broke apart and killed co-pilot Michael Alsbury and injured pilot Peter Siebold. An investigation later determined the 2014 accident occurred because Alsbury unlocked Enterprise's feathering descent system too early. This unique feathering design, which Virgin Galactic describes as critical to a reliable and repeatable re-entry for a winged vehicle, incorporates additional safety mechanisms adopted after the 2014 VSS Enterprise accident. VSS Unity is the first vehicle to be built from scratch for Virgin Galactic by its manufacturing subsidiary The Spaceship Company, based in Mojave, California. This includes the Unity’s hybrid (nitrous oxide/HTPB compound) rocket motor. The April 5 test saw VSS Unity complete its first supersonic, rocket-powered flight after what Virgin Galactic describes as two years of extensive ground and atmospheric testing. The suborbital spacecraft was first rolled out on February 19, 2016. The company explains passing this powered test marks the start of the final portion of Unity’s flight test program. 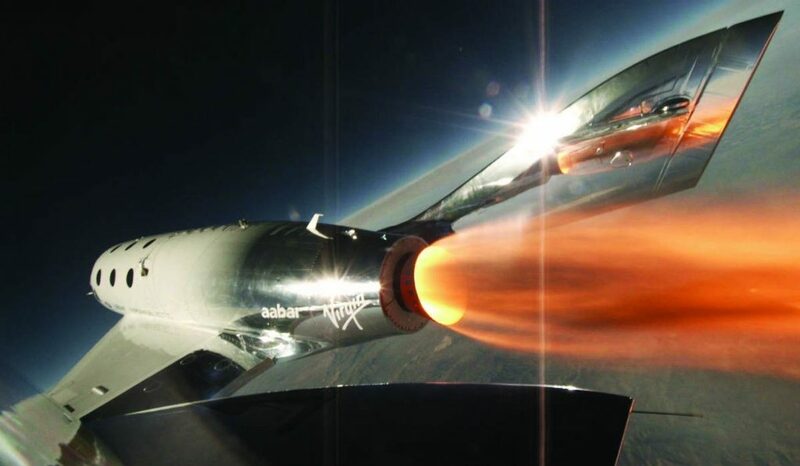 Virgin Galactic says the April 5 flight saw an expansion for the program as a whole in terms of rocket burn duration, speed and altitude achieved. VSS Unity took off from the Mojave desert at 8:02 am with Mark “Forger” Stucky and Dave Mackay in the cockpit, attached to the WhiteKnightTwo carrier aircraft, VMS Eve, piloted by Mike Masucci and Nicola Pecile. The mated vehicles climbed to a launch altitude of around 46,500 feet over the Sierra Nevada Mountains, explains Virgin Galactic, before Eve executed a clean release of Unity. The company explains, that after a few seconds, Unity’s rocket motor was brought to life and the pilots aimed the spaceship upwards into an 80-degree climb, accelerating to Mach 1.87 during 30 seconds of rocket burn. The rocket motor, which was designed, built and tested by The Spaceship Company, powered through the transonic range and into supersonic flight for the first time. On rocket shutdown, Virgin Galactic explains Unity continued an upwards coast to an apogee of 84,271 feet before readying for the downhill return. At this stage, the pilots raised the vehicle’s tail booms to a 60-degree angle to the fuselage, into the feathered configuration. At around 50,000 feet, the tail-booms were lowered again and, while jettisoning the remaining oxidizer, Virgin Galactic explains Unity turned towards Mojave for the glide home and a smooth runway landing. The test generated what the company describes as valuable data on flight, motor and vehicle performance, as the program enters the phase of powered flight and the expansion to full duration rocket burns.